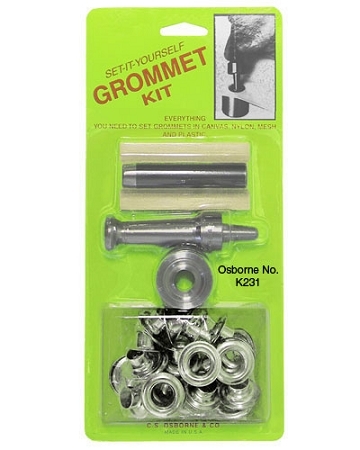 1/4" - #0 Set It Yourself Grommet Kit - Nickel Plated Brass manufactured by C.S. Osborne. A complete kit for the do-it- yourself consumer wanting to set only a few dozen grommets. Each kit consists of a midget grommet setter, a belt punch, 48 brass plain grommets and washers, a small cutting board and complete instructions! Size indicates the inside diameter of the centre hole of the grommet, not the outside perimeter of the grommet.